The last couple of years have been very exciting and huge. I’ve taken the proverbial step and leapt off the cliff!! 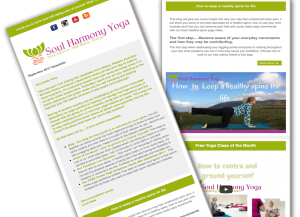 In June 2016 I married a truly lovely man and we then set off on the journey of a lifetime from the UK to emigrate, travel and film yoga classes in Australia and create our new website ‘Soul Harmony Online Yoga’. It’s November 2017 as I sit and write this. We’ve now discovered and live in a beautiful place on the planet called Albany, in Southern Western Australia. 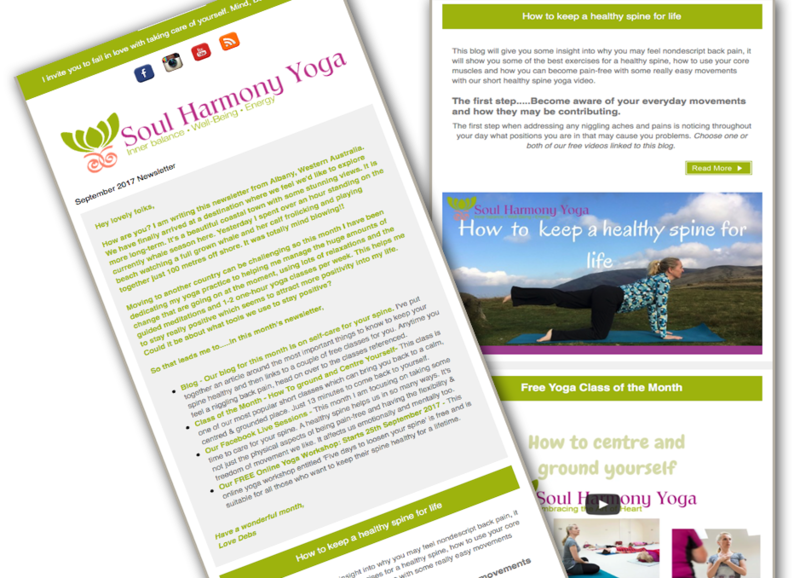 We’ve filmed over 50 Yoga classes and have, lovingly, filled our website with them, as well as blogs and workshops. It’s my mission in life to teach what I love and love what and who I teach. Although it’s not the easiest of roads to take, what drives me is knowing that on many levels I am contributing to helping myself and others to bring more peace and balance into the world. Based on what I’ve experienced in life, I’ve chosen to do this through Online Yoga Website, Soul Harmony Yoga. I’d love you to join me in this quiet revolution and as Gandhi says “In a gentle way, shake the world”. 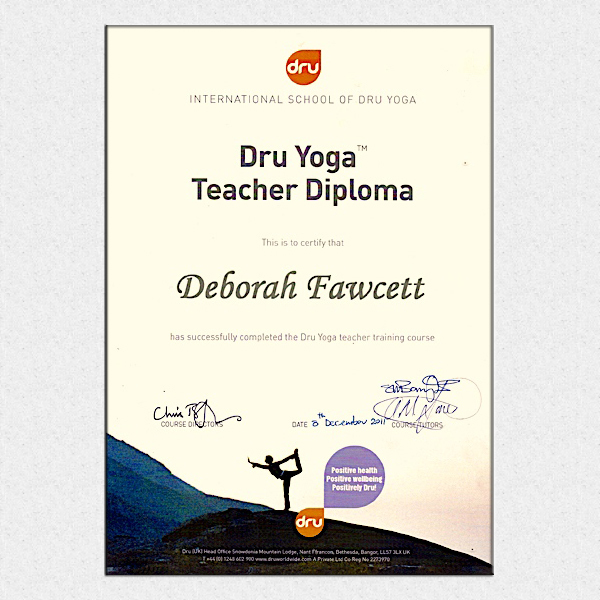 I am a qualified Dru Yoga teacher & have practiced yoga for 23 years and been teaching for 7 years. 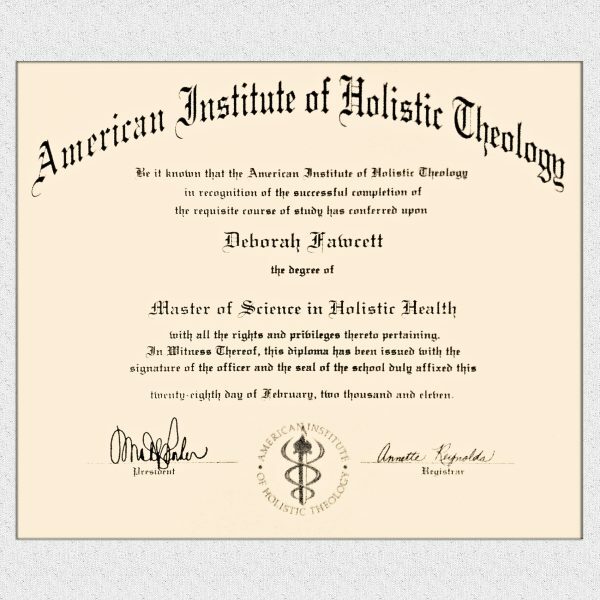 I have a Masters Degree in Holistic Health. I began to become interested in the more subtle aspects of life at the age of 19 after spending a year travelling to Australia. I began to question what was behind our everyday life and became fascinated by Buddhism and Meditation. It was around this time I started attending my first yoga class. My yoga class then and now, helps me to stay balanced, peaceful and strong in the ups and downs of everyday life. I completed a two year Para/Energy Psychology Course in my mid-twenties which explored who we are as energetic beings. I learned to rebalance my own and others energy fields using hands-off healing techniques and crystals. It was a weird and wonderful course and I still use many of the techniques for myself and incorporate them as visualisations into my relaxations and meditations. Yoga, meditation, relaxation and healing are a part of my weekly life as I continue to explore this relationship with body, breath, emotion, mind and spirit. 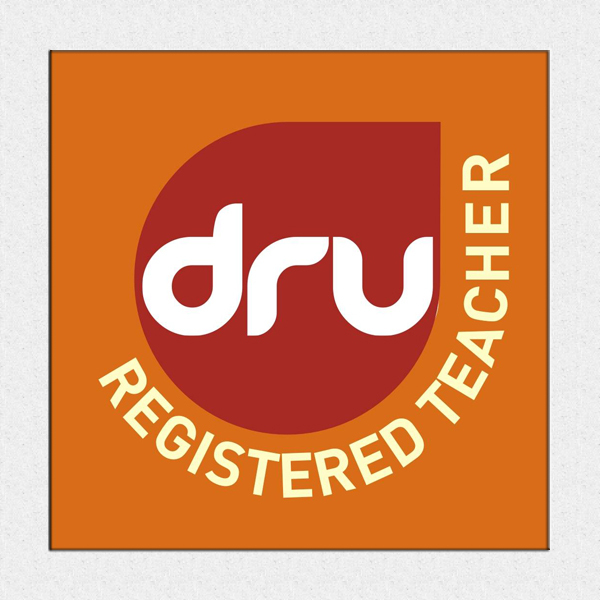 I’ve attended (and continue to go) on many retreats including the 10-day silent Vipassana Retreat in 1999, Dru Yoga Retreats and courses, personal development courses & seminars, online courses & yoga conferences. I love learning and continuing to grow. My teachings are a combination of all my earlier courses and explorations, along with a deep connection to my own inner creativity, and this is what make my classes and teachings so unique. All my teachings are based equally on nurturing the physical, emotional, mental and spiritual aspects of ourselves. 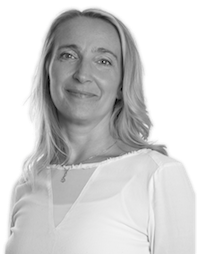 I stay grounded in my approach by staying in touch with the latest Yoga research and have studied extensively to ensure my practice is both knowledge and experiential. In my teachings, my intention is to take you to a deeper level within yourself and gently guide to accept and naturally release what no longer serves you. I will guide you to mindfully find your own physical & inner strength & go beyond into a wiser, more peaceful and balanced space. Space where your energy becomes more vital and alive, a place where you truly feel an unfathomable sense of your true inner strength and wisdom. My classes and workshops reflect the patterns and seasons of nature, hence the filming in some amazing places in nature. I love connecting with nature in my teachings using visualisations and references to all the beauty of nature that is around us. It helps you to become aware of, and more in tune with, the natural rhythms of the world around you. Nature is a free and powerful tool to help us become more energised and balanced and this is a large part of what we do at Soul Harmony Yoga. As a way of nurturing myself and my work, I ask people to sign up for longer videos. Nutrition on the go! Smoothie recipe. 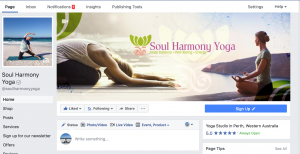 I connect with my followers and students mostly through my Facebook Page ‘Soul Harmony Yoga’ and I also have a Private Facebook Page for my students who have online memberships with me. In this group, I teach Live Yoga classes and regular mentoring sessions to support and encourage you to create time for yourself and your own health and wellbeing. Join my Soul Harmony Yoga Facebook Page here. My other social media links are at the base of this blog. I’d love you to join me on my mission to bring about more joy, balance, and peace into the world. I send out a monthly newsletter which includes our latest news, blogs, free videos and inspiring articles on yoga, relaxation, meditation and holistic health. Receive your timely reminder to priortise your self-care and creativity. Be inspired to make small steps which bring about big changes. You can update your details or unsubscribe at any time. My students are those people who want to create time for their own health and wellbeing. They are the givers in life. However remember, we need to give to ourselves in order to give of ourselves. Choose to do this through our yoga, meditation or relaxation classes or delve in deeper through our Health Workshops. If you’d like to connect with me just send me a message via the form below.